Team 2848, the All Sparks, is a 2014 World Champion FIRST Robotics Competition team from Jesuit College Preparatory School in Dallas, Texas. Note: This article is part of a series, documenting the All Sparks through the FIRST robotics season. To find the other parts of this series, see the list at the bottom of the article. After a few weeks of prototyping and analysis, our team has gotten to the point where we have a pretty good understanding of the game and the best ways to score. 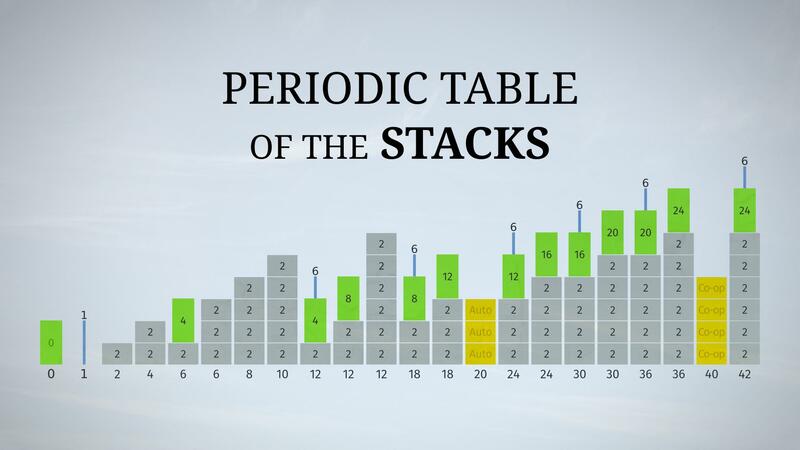 While this game is absolutely about stacking, it is important to note the difference between point values in stacks. Thomas Clark, a previous member of FRC Team 237, Black Magic Robotics, created this image to help break down the complexity of scoring this year. 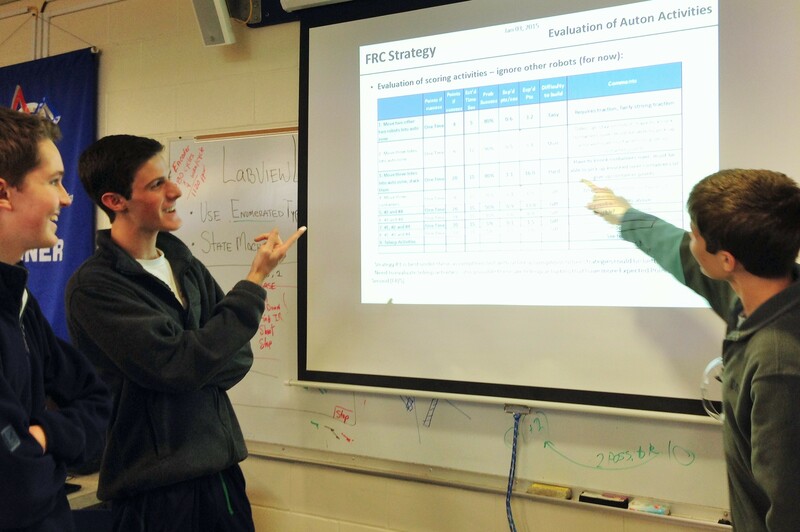 One of our team mentors is a statistician, and helps the students run predictive analysis of game play to make sure that our theories will lead to to actual results. One important part of this strategy is figuring out the maximum number of points that any one alliance could potentially score. We have broken down our logic on our team’s site for those that are interested, and have determined that the theoretical maximum points for any one alliance, assuming a “perfect” game, is 434 points. While that is an extremely lofty goal that we think will be unlikely, even at the World Championships, it does give some idea of the limits of the game, and what may be required to be a winning alliance at a regional event. We can break down the point structure even further if we look at the maximum points that any one robot may be able to score based on the tasks they can perform. For example, if a robot is only able to stack totes, how many points can that individual robot earn by itself? If we add up only the points related to stacking totes and human player actions, a “perfect” tote-stacking robot earn 240 points by itself. The extra 194 points that are possible for a “perfect” game must come from either additional robot functions or from the other robots on the alliance. The tournament structure of FRC has each team playing an equal number of matches as part of a three-team alliance, both with and against randomly assigned teams. This means that a team cannot always count on an alliance partner to consistently perform any one action, because during qualification matches, they may play on an alliance with any number of different robots. Once teams reach the elimination rounds and elimination alliances are selected, those alliances will carry through until a winning alliance is determined. In this game, an ideal alliance would consist of robots that each specialize in different tasks working together. In actual practice, qualification matches are rarely ideal. During a match, a robot that stacks totes well may end up playing with two other tote-stacking robots, or with a tote-stacking robot and another team that was unable to get their mechanism to pass inspection and therefore can only push totes and containers around the field. A solid tote-stacking robot may be the best way for teams to ensure that they will always be able to score at least some points, but that strategy can leave roughly half of the potential points unaccounted for if there are no robots that are able to manipulate containers or litter in their alliance. However, the opposite strategy of a robot that is built to manipulate containers or litter relies heavily on the ability of their partners to be able to at least make smaller stacks of two or three totes. Teams need to determine how their container or litter robots would be able to reach 240 points by themselves in order to determine which strategy will work the best for their team. A simple solution may be to just build a robot that has individual mechanisms for each individual task. This year, the size limitations of the robot are loosened as long as the robot is able to fit into “transport configuration” (an imaginary box no more than 28″ x 42″ x 78″) when entering and exiting the field. Once on the field, the robot can expand in all dimensions except for height, as long as it takes less than 60 seconds to configure the robot on the field for a match. Unfortunately for teams that may choose the “swiss army knife” approach to robot building, the 120 pound weight limit still stands. Teams that choose to use expanding mechanisms on their robot may find that they do not have the available weight to make the mechanisms as robust as they should be, or as reliable as they would like. One of the common problems we see less-experienced teams running into is trying to do too much with one robot in an attempt to get around some of the limitations of the game, and by extension, failing to do any one task particularly well. Our team’s goal is always to be able to do one task exceptionally well, and we will fit in any of the other tasks that we think could be helpful as size and weight permit. It will be extremely interesting to see how some of our game theories start to play out once regional events start.